Rayanne Buchianico is consistently one of our most popular instructors. 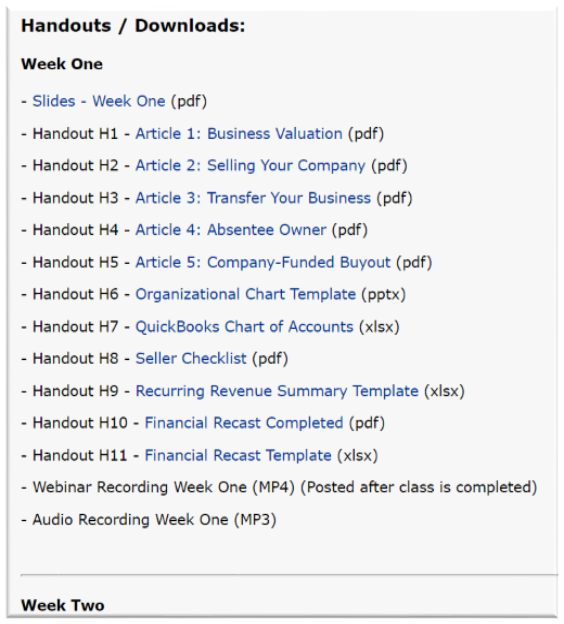 I just uploaded the handouts for Week One of her new course . . . and it looks amazing! Our classes always excel with the number of handouts we have. But we rarely have 20+ pages of handouts on one day. As you can imagine, the class hits the ground running! No wasting time here. 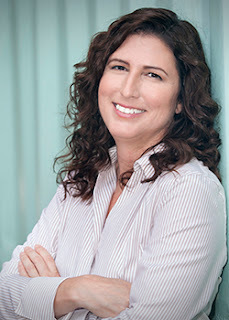 Rayanne Buchianico is an Accounting Professional and QuickBooks Advisor. Rayanne has been an MSP - managed service provider - for many years and advises MSPs on how to get the most out of their QuickBooks and PSA integrations. This course includes five weeks of webinar classes with related handouts, assignments, and "office hours" with the instructor. It is intended for business owners and managers. 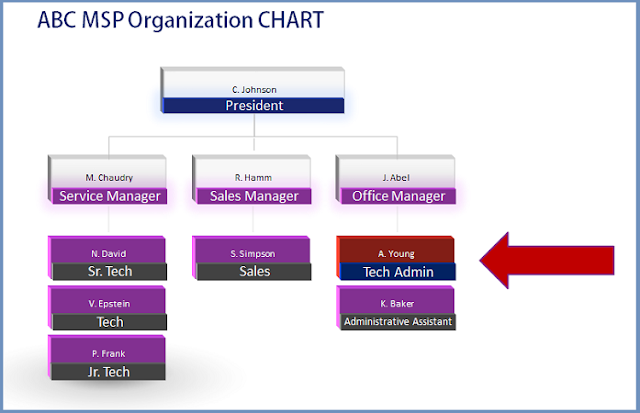 It is particularly useful for the Owner or Operations Manager. Final cover - Due this week. Maybe today. Belarusian language edition - Not anticipated for this work. 1. 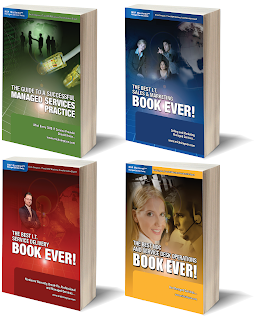 If you are a member of the Small Biz Thoughts Community, you will receive this book at no additional charge inside the Community. 2. You are a member of the Small Biz Thoughts Community if you've gone to SmallBizThoughts.org and paid to be a member. More details at bit.ly/sbtinfo. We are in great shape to deliver this book in PDF format by the end of April. Once again - Thank You to everyone who has supported me over the years. I trust you will find this book to be another tool in your tool set for the 2020's and beyond. Reminder: Mother's Day is just around the corner! If you follow me on Facebook, you may have seen that I signed up to try Lyft's Driverless Car experience in Las Vegas last week. Here's the report on that. When I took my Lyft to the hotel in Vegas, I was offered the opportunity to use their "Driverless" option. That's in quotes because there are TWO technicians in the front seat. One is the driver and the other appears to be there to explain everything to the riders. 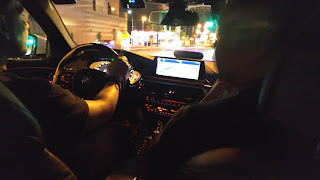 After a few regular Lyft rides, I was informed that the driverless option is only available from and to certain areas. Rides to and from airport are not eligible. I think I finally got the driverless option on day five - from the Fremont Street Experience to our hotel. First thing I noticed: This is the ugliest BMW you will ever see. Second: This is definitely a test environment. Massive display of digital information on the screen (you're not supposed to take pictures). 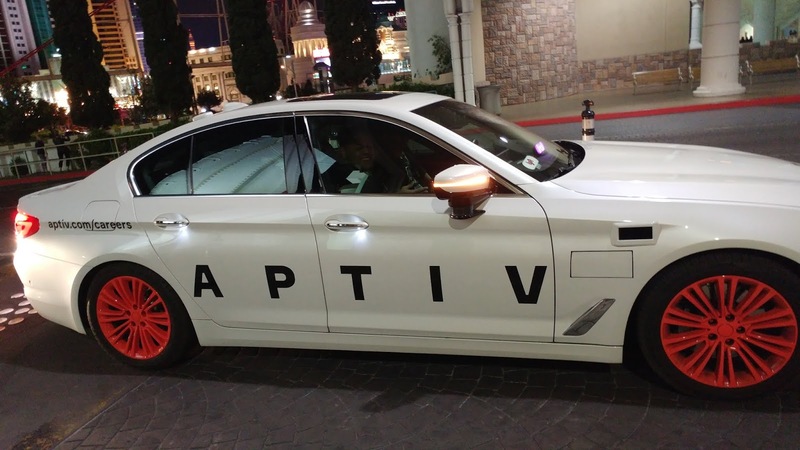 As you can see, Aptiv is running the driverless test and data collection. Third: No drinks allowed. As dude explained, the rear passengers are sitting on top of two super computers. I think we have different definitions of what that phrase means. The Ride started with the driver (Jordan) actually driving the car. He wound around until we were well out of the Fremont Street craziness. Once we hit Las Vegas Blvd, he switched the car to driverless mode. The car kept pace with traffic and smoothly stopped all by itself. NOTE: All the higher end BMWs do this. So nothing new there. This car also started by itself when the lights turned green or traffic in front started to move. On the display, you could see indicators for whether there were cars on the left, right, and in human blind spots. Theoretically, it can change lanes by itself. We did not see that. At one point, we were behind one of those mobile sign trucks. These are basically moving billboards. They go slower than normal traffic in order to maximize their visibility. Jordan didn't want to stay there, so he took control and changed lanes. That was the only "abrupt" move in the experience. After a few minutes, the driverless control took over again. When we got to our hotel, Jordan took over again and drove us to the hotel front door. 1) This is not much of a proof of concept. I know for a fact that I can buy a car off the lot that's more "driverless" than this experience. 2) Apparently, they have sensors embedded in street light controls all up and down LV Blvd. My assumption is that they are testing two way communication more than the actual driverless technology. 3) More than once, the explainer guy (who's name I did not catch) used the term Lidar, and explained that their cars will soon be able to communicate with one another as well as the traffic controls. So, once again, I suspect they are working on a bigger picture than simple driverless technology. Las Vegas is one of the most cutting edge "smart cities" and this could take them to a new level. According to my Lyft app, this ride was 5.72 miles and took 31 minutes. If it had been a regular Lyft ride, I suspect we would have taken a different route. But their test is on LV Blvd. My guess is that we were driverless about 2/3 of the time. It was perfectly safe. And not particularly cutting edge. For those who think that driverless cars won't happen in your lifetime, please note how much money is being pumped into this stuff. There are many layers beyond the simple robotic control of the automobile. And companies are working on next-generation technologies that are complementary with driverless cars. Or at least the first 99%. The writing is done. Now on to the technical details. Producing a book is about 50% creativity and 50% technical details and "all the little crap." As of this moment, the details and technical stuff has begun. NOTE: If you are a member of the Small Biz Thoughts Community, you will receive this book at no additional charge inside the Community. My goal is to have the book available in PDF format by the end of April. ith luck, it will be available in Kindle format (on Kindle) by the end of May. If we're really, really luck, the book will be available in print by the end of May. An audio book version will be out by the end of the year. That's all I'm going to promise. Order before April 30th and we'll send you both the PDF and the paperback when they are available! Note: The price will go up to $44.95 on Tax Day (April 15th). And the final price of $49.95 will be effective May 1st. 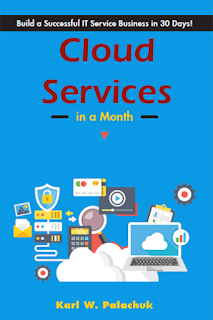 All community members will be able to download the PDF version of Cloud Services in a Month as soon as it's finished. I hope that's by the time of our Final Friday meeting. But I promise it will be done by the end of the month. Are you looking for new and competitive ways to grow your cloud business? Join us at ACCELERATE 2019, SherWeb’s annual cloud summit. This two-day event is being held on October 10-11, 2019 at the DoubleTree By Hilton Hotel in downtown Montreal. This is where you want to be for meaningful learning, networking and growth. Register before May 17 and save $400 on your registration fees! The SherWeb Cloud Summit is open to all, whether you are a SherWeb partner or not. I am VERY excited about this webinar (and whitepaper) in association with IT Glue. 9AM Pacific / 12 Noon Eastern. How does the current merger and acquisition (M&A) frenzy affect your business? Regardless of which side of the action you’re on, there are various opportunities at hand for you to take advantage of in order to build a thriving business. 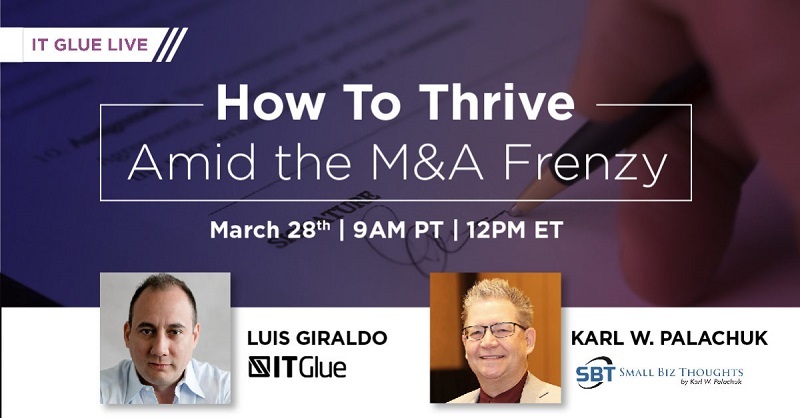 To learn how you can avoid getting caught up in market pressures, join our webinar featuring IT Glue’s VP of Product, Luis Giraldo, and me. This is your opportunity to gain a new perspective on M&A, alongside techniques and strategies for running an efficient business regardless of what your competitors are up to. Register to tune in live! Bonus: Attend the webinar LIVE to gain exclusive access to the official M&A Frenzy Whitepaper. Are you interested in being a buyer? A seller? Just staying out of the way and focusing on your business? 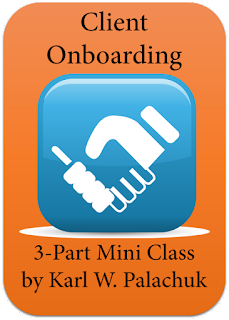 Whichever you choose, we think you'll love this webinar. We cover what goes on in an M&A deal, and how it affects you - even if you're just trying to survive during this period of "frenzy." 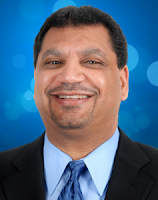 What exactly does that mean for your MSP? Other means of driving profit: did you know documentation is profitable? Plus lots of time for Q&A.